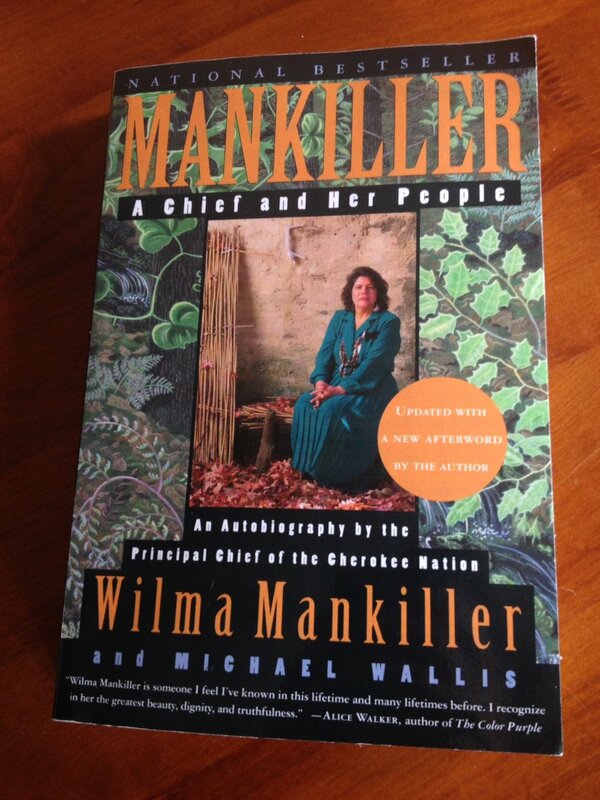 I am so excited to finally be able to share Wilma Mankiller’s gripping autobiography Mankiller A Chief and Her People with you! I finished reading it a few weeks ago and finally have time to get my review online. While researching this article, I also discovered that a documentary, Mankiller, was just screened for the first time this month (August 2017!). Can’t wait for a chance to watch it when it becomes more widely available, and to learn more about this inspiring Cherokee woman. One thing that really surprised me about this autobiography is that a good half of the book is dedicated to telling the story of the Cherokee people, and not to the author’s own life (although she does weave the two narratives together). I found this incredibly helpful, because I am still learning about the history of the Cherokee, and her detailed account of their culture from the 1500s onward is fabulous. She places particular emphasis on the members of the Cherokee tribe who were forced to march 900 miles (mostly on foot) from their homelands in the southeastern United States to “Indian Territory,” or present-day Oklahoma, between 1838-39. These death marches have gone down in history as the “Trail of Tears,” but have been largely ignored by modern history textbooks (I’d heard of it maybe once before I started researching Cherokee culture, despite majoring in history, which underscores the desperate need for more Native American studies in our schools and universities). No records were even kept of how many Cherokee perished along the way: there are estimates of 4,000 or more, and archeologists are only recently beginning to dig at the sites of historic forts along the Trail of Tears, where the Cherokee would have been barricaded inside during stops along the march. The Mankiller Family’s rural, live-off-the-land lifestyle came to an abrupt halt in 1956, when the family joined many other Native American families from across the country in a devastating government scheme designed to solve the so-called “Indian Problem.” (Had I ever heard of this modern-day effort to stamp out Native culture in my history classes? No, no I had not.) The Bureau of Indian Affairs (BIA) hatched a plan (put into law as the Indian Relocation Act of 1956) whereby they decided to do their level best to break up rural Native American communities across the country. (Reasons for this included a desire to save the government money by halting spending on health care services and schools for Native American reservations.) The BIA basically lied to Native people on reservations across the country about all the wonderful opportunities to be had in the "City" (San Francisco, where the Mankillers relocated, was among the many metro areas to which the BIA moved Native families). They were promised jobs, money for the transition, vocational training, and a better future for their children. As was the case with many Native American families, however, the Mankillers did not benefit from their move: quite the opposite, in fact. Wilma Mankiller describes her first impression of San Francisco: “The noises of the city, especially at night, were bewildering…We had never heard sirens before. I thought it was some sort of wild creature screaming. The sirens reminded me of wolves.” They faced poverty, crime, and racism, along with homesickness and a disconnect from their beloved cultural practices, such as ceremonial dances. She worked tirelessly to promote the cause of the Cherokee Nation throughout her life, and was awarded the Presidential Medal of Freedom in 1998 for her advocacy for her people.